Nesmuk certainly ranked among the best kitchen knives in the World ! Lars scheidler, founder and proprietor of Nesmuk, is today one of an elite few bladesmiths to have completely mastered the art of knife making. Lars is absolutely passionate about his work. Nesmuk is not merely proof of his outstanding talent, but also of his acute sense of perfect balance, optimum function and timeless design. Nesmuk is a name that represents a unique symbiosis of tradition and personal experience, precision workmanship and uncompromising function. The basic form of the Nesmuk knife is a type of knife that existed 3,500 years ago. inspired by the aesthetic appeal, efficient function and logical shape of this “original knife”, Nesmuk has re-interpreted and perfected it. In order to achieve superior results, Nesmuk uses data collected in many years of studies and comparative analytical tests, this data enables the production of all Nesmuk knives according to the optimisation principle. they deliver optimum material quality and composition, perfect blade geometry and maximum precision. The range includes the exclusive, hand-crafted Nesmuk Exclusive, the Nesmuk Janus, the Nesmuk Diamor ® and the Nesmuk Soul. The high performance steel selected for the Nesmuk Janus, diamor® and souL knives has an unusually niobium content. 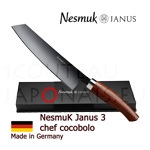 this gives the blade metal a very fine structure, which means that a sharpness almost matching that of the hand-forged Nesmuk eXkLusiv can be achieved even though the steel is stainless. The Nesmuk knives received the international knife Award for best design at the IWA fair. The Nesmuk Diamor knife: The diamond-like carbon (Diamor®) coated blade, which is manually hollow ground on both sides, guarantees extremely long-lasting edge retention and excellent cutting properties. The only material with a hardness superior to this coating is a diamond. Nesmuk Diamor® is a revolutionary knife that unites skill, experience and advanced materials in an absolutely unique way. in collaboration with the fraunhofer institute for material and beam technology in dresden, the blade was hollow ground on both sides and a diamond-like carbon (Diamor®) coating was applied to maximise the blade’s edge retention. the coating thickness is only 1.5 mµ, yet its extraordinary hardness is only surpassed by a pure diamond. this Diamor® coating is responsible for the knife’s outstanding cutting performance, while the steel merely functions as a carrier medium. the solid silver collar and the aesthetic fine wood or finest micarta handles emphasise the excellent quality of craftsmanship that goes into making these knives. Every Nesmuk Diamor® knife comes with an exclusive black lacquered wooden box and a fine, black silk-matte lacquered wooden sheath. the sheath protects the user from injury and the cutting edge against damage and blunting. Nesmuk Diamor®, FGW-certified cutting performance. The blade of every Nesmuk Diamor® knife incorporates a diamond logo as a sign of quality and authenticity. Diamor® is a registered trademark of the Fraunhofer Institute for material and beam technology, Dresden. It may only be used by Nesmuk kG for hand-held knives. 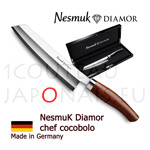 Nesmuk diamor® delivers excellent and lasting sharpness, the diamor® coating has a hardness of 5,500 vickers. 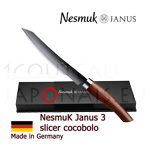 The Nesmuk Janus knife 3.0 combines Nesmuk’s knife-making skills and many years of experience with state-of-the-art materials and production methods. A high-quality DLC coating (diamond-like carbon), a 3 mµ thick, amorphous carbon coating containing silicone, delivers impressive hardness (2,300 vickers), low friction values and high adhesive strength. The patented blade in stainless, high-performance steel with a high niobium content has a very fine structure, despite being stainless, ensuring lasting edge retention. Hollow ground on one side with a fine manually-sharpened finish, the Nesmuk Janus 3.0 guarantees an incomparable cutting experience. The solid silver collar and the aesthetic, solid fine wood or finest micarta handles emphasise the outstanding quality of these hand-crafted knives. The head of Janus is stamped onto every single blade as a guarantee of quality and authenticity. Janus is the doublefaced roman god looking back and ahead which, like the Nesmuk Janus cooking knife, represents unity of tradition and progress. Certified steel hardness of 61 (+/–1) hrc and niobium provide the finest steel microstructure and outstanding sharpness. 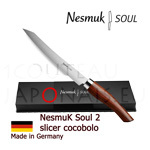 The strong handle of the Nesmuk Soul knife is ergonomically shaped to fit the hand and produced in a variety of fine woods and highest quality micarta. The nesmuk Soul’s collar is available in either silver (model 2.0) or stainless steel (model 1.0). Certified steel hardness of 61 (+/–1) hrc and niobium provide the finest steel microstructure and outstanding sharpness. 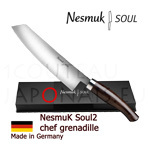 The Nesmuk Soul’s blade design with thickness 3 mm, outstanding cutting performance and balance between sharpness and useful life perfectly reflects the «essence» of this type of knife. the blade is hollow ground on one entire surface and made of rust-proof high performance steel with a niobium content for unique edge retention and strength, as well as a very fine cutting edge and sharpening angle. 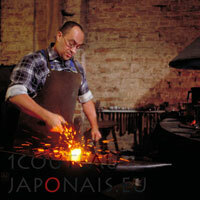 The «original knife» logo is applied to every blade as a sign of quality and authenticity. It stands for optimum quality and first-rate craftsmanship.